With Alastair McEwin, Breda Carty in background. Last week Alastair McEwin started his new job. He is Australia’s new Disability Discrimination Commissioner. And he’s deaf. He was born deaf, into a hearing family. He speaks and he uses Auslan, he’s bilingual. In the past year or two we have seen a number of other deaf people take up high level roles: Dean Barton Smith as CEO of Deaf Children Australia, Leonie Jackson as CEO of the Deaf Society of NSW, Rebecca Adam as interim CEO of the WA Deaf Society. They join Matthew Wright CEO of Australian Federation of Disability Organisations, Kyle Miers CEO of Deaf Australia, Brett Casey CEO of Deaf Services QLD, and Colin Allen volunteer President of the World Federation of the Deaf, who have all been in their positions longer. Deaf Australia’s CEOs and the WFD’s Presidents have always been deaf people, and AFDO’s CEOs have always been people with a disability, but the other organisations have always had non-deaf CEOs until now. And many in the deaf community have been highly critical of the ongoing failure to appoint deaf people to high level positions, especially in deaf community organisations. Things are changing now and it’s so exciting. Of course, many things have been changing for a long time. It’s been slow, but things have changed. Last year at our annual Christmas-time lunch, my friends Breda and Maree and I were discussing deaf community issues and Breda commented on how much things have changed in the past twenty years. I said, “Yes, but twenty years is an effing long time!” and for some reason we all found that very funny. When I went to university in the 1970s I was the only deaf person there, no one had any idea what to do with me and there were no support services. Support services started appearing in universities in the 1980s, an initiative of the late Des Power at Griffith University in Brisbane that was slowly taken up by other universities nationally, and deaf university students now are generally well supported. Of our new high flyers, Alastair, Brett and Rebecca all have law degrees, Leonie has an education degree, Dean has a marketing degree, Kyle has a leadership and development degree and Matthew has an arts and human resources degree. When I became Executive Officer of Deaf Australia in 2001, following in the footsteps of Brett Casey and Carol-lee Aquiline, there were no deaf CEOs elsewhere in Australia. Hearing people were sceptical of deaf people’s ability to lead and to manage organisations. One day in 2003, soon after we moved the Deaf Australia Sydney office to the RIDBC campus at North Rocks, a hearing teacher at one of the RIDBC schools wandered in to see what we were all about. I was not in the office and one of my staff, Natalie, talked to her. The teacher asked if Natalie was deaf and when she said, “Yes, we are all deaf,” the teacher seemed amazed. The question was asked a number of times in disbelief. For our part, Natalie and I were shocked that someone who taught deaf children could have such a poor opinion of our abilities. But deaf people too are not always supportive. There is a breed of deaf person who looks at deaf achievers and relentlessly criticises every minor mistake – real, imagined, misinterpreted or misunderstood. There is a breed of deaf person who, when a deaf achiever does something this breed doesn’t like, decides never to forgive them. This one thing then cancels out or at least taints every good thing the achiever does. There is a breed of deaf person who has been indoctrinated to believe, often subconsciously, that hearing is better than deaf and therefore no deaf person can ever really be successful. And this, my friends, is what I sincerely believe we all need to do. Give each other a go! There is a lot of negativity in the deaf community. And a lot of this negativity is there because it’s what we’ve been taught and how we’ve been treated in a world overwhelmingly designed for and lead by people who hear and know nothing much about deaf people. It’s what we know. But there’s also a lot of good people and a lot of positivity in the deaf community. It’s time to build on that. It’s time to stop cutting down the tall poppies. It’s time to put aside doubts and jealousy and grudges and support each other to do the best we can. Of course, there are a lot of deaf achievers at all levels and in all walks of life. In education and academia, in the trades, the law, the arts, in sports. But it’s the leaders, the CEOs and the publicly prominent who seem to cop the most flack. The Australian deaf community started changing rapidly in the 1980s and early 1990s. This was the decade when the welfare and interpreting roles were split into two separate professions, when Auslan was recognised as a real language and given a name and a dictionary by Trevor Johnston, when Deaf Australia (then known as Australian Association of the Deaf) was established to lead and represent deaf people and modern deaf advocates began emerging, when TAFE and universities began providing support services, when Deaf Studies was introduced by Breda Carty and we all learned more about ourselves and our community, when Australian Theatre of the Deaf was formed and began bringing Auslan and deaf stories to us and the masses. And so much more. It was a truly vibrant time to be part of the deaf community. Those of us who were part of that era did what we could with what we had. Many of us didn’t have all the skills and experience we needed for the roles we took on, either voluntarily or paid, but we believed in ourselves, each other and our cause, we learned on the job and acquired skills and qualifications along the way. The work we did back then paved the way for today’s achievers. I’m so proud of what we achieved back then and in the years since. And I’m so proud of today’s achievers. They are paving the way for tomorrow’s achievers. One of my mantras for life is: we all do the best we can with what we know at the time. What we know changes as we learn and grow. What we did yesterday we might do differently today but it doesn’t mean that what we did yesterday was wrong or not good enough. It was the best we could do with what we knew at the time. So let’s stand by today’s achievers and support them. Let’s give them the space and the grace to learn and grow and do the best they can for us with what they know at the time. We will, I am sure, be richly rewarded and our community will also learn and grow and breed new achievers to do even better with what they know. When we support achievers in our community we all benefit from their achievements. For some time, many of us in the deaf community have been saying we need a modern version of the deaf club. We loved our deaf clubs but the old format will no longer work. The world has changed. The community has changed. Deaf Societies are still very important organisations but they are now only one of a number of organisations providing services for deaf and hard of hearing people. There are still sections of the deaf community who are either dependent on Deaf Societies for welfare-type assistance or who have a long association with them and are unready or unwilling to consider other options. However, many deaf people are now quite independent of the Deaf Societies. Many people rarely visit or contact their Deaf Society, even if they use their interpreting service – interpreting bookings are made by the person who pays, which is not usually the deaf person. If the NDIS is rolled out according to the model set out by the Productivity Commission, deaf people’s choice in where they go for services should increase as new providers emerge. Early intervention services that historically focussed only on speech and separated themselves from the deaf community are now being encouraged to be more inclusive and collaborative. (However, I recently heard some information that indicates this change is turning back towards excluding Auslan from early intervention – but that’s the subject of a separate blog post). As the experiences of deaf communities in Sydney, Melbourne and Brisbane have shown, a deaf club in a mainstream setting, divorced from deaf community organisations, is a club that lacks a deaf soul. The world is moving on from the old welfare and paternalistic one-organisation-does-everything-for-you models and it would be anachronistic for the deaf community to return to such a model, but there is still a case for a deaf community centre that provides a mixture of services, social activities, representative and advocacy support and so on in one easily identified location. But now it needs to be owned and managed not by one all-powerful organisation but perhaps by many. They do it in Finland and they do it in Ireland. We could do it here in Australia. It would be wonderful to have something similar in Australia. As an example, in each of our capital cities and major regional centres we could have a small community centre for deaf and hard of hearing people that houses at least some of these organisations: Deaf Australia, Deaf Youth Australia, Better Hearing Australia, The Auslan Shop, deaf sports and recreation organisations, self-help groups such as Hear for You and Cicada, a deaf church (office/s if not the actual church/es), ASLIA and various service providers – Deaf Societies, interpreting service providers, Australian Communication Exchange, Deaf Children Australia, assistive hearing technology providers, early intervention services, adult education services and so on. And a café/bar – managed by deaf people who are trained and paid to manage it. We could perhaps have something like a strata title or leased building where organisations own or lease the portion of the building that they inhabit and contribute to the maintenance of common areas. We could have small community centres where no one organisation is more important or powerful than any other, where no one organisation has its name in lights as ‘the’ organisation or ‘the’ building owner. I think it would be difficult because only service providers have money; community organisations like Deaf Australia (especially now that government has defunded it), sports and self-help groups, would struggle to contribute to ownership or lease costs. But I believe a modified version could be possible. It would require some major shifts in thinking in our service providers, particularly Deaf Societies. And it would require deaf and hard of hearing people to take the lead in our own community and make it happen. An alternative might be a version of what is happening in Adelaide. Perhaps several service providers could contribute to funding separate small community centres for community organisations to run as deaf clubs. Another alternative might be for simple café/bars, with kid’s corners and Auslan-literate staff, which become deaf community meeting places. Trade Block café, in the grounds of Deaf Children Australia in Melbourne and staffed by Victorian College for the Deaf students is very popular, but it is small and its hours are limited. An expanded version in various locations around Australia, accessible to everyone, deaf, hard of hearing and hearing, could be a hit. Personally I love this idea. Whatever option we come up with, it’s important that any new meeting place is ‘owned’ by the deaf community, not by any all-powerful service organisation. Deaf people are fond of saying that we can do anything. We like to demand our rights. The community has the capability to run its own deaf clubs but few have stepped up and accepted the challenge. Can we continue to claim we can do anything and yet expect others to continue to do things for us? We can do this. We can create new types of deaf community meeting places that are inclusive and bilingual places where Auslan and English are equally valued and where deaf, hard of hearing and hearing people, parents and service providers feel welcome, equal and at home. And then let’s see what kind of modern Auslan sign the community develops for ‘deaf club’. How important is it to have a deaf community meeting place? How can we make it happen? Until the mid 1990’s, deaf communities in Australia were centred on their deaf clubs, based at the Deaf Societies. It was a well-organised, active, vibrant community. And then everything changed. Education became increasingly mainstreamed; deaf students now have less contact with each other and the wider deaf community. Deaf Societies began having serious money problems. Everything became more expensive, the charity dollar more elusive, government regulations and funding accountability requirements more onerous. Institutionalisation was on the way out. The focus on community fell out of favour with the Deaf Societies and capitalist-style business models became king. The Deaf Society of NSW closed its unprofitable nursing home and hostel, sold its Stanmore site and leased rooms in an office building in Parramatta. It became more ‘professional’, hived off its community centre and deaf club was no more. For a while, a small group of deaf people tried to establish deaf pub at Lidcombe Bowling Club. But deaf people didn’t feel connected to it. The soul of the deaf community was absent, its spirit crushed. The Stanmore site is now part of Newington College. The back of the site can still be glimpsed as you trundle past on the train, but instead of the wide gap with a flash of white and a dash of red, the space where the bowling green once basked in the sun is now filled with a dull brown building. Gone is the romance of a more genteel and spacious era. NSW started a trend. Only Western Australia and South Australia still have deaf clubs. The WA Deaf Society hosts it in a small hall with a bar in their premises in a block of business suites where you can’t just walk in after hours, someone has to let you in. South Australia’s deaf community recently experienced traumatic change when the historic Deaf Society building at 262 South Terrace, Adelaide was sold against their wishes. Early in 2014 Townsend House, which now operates the SA Deaf Society under the name DeafCan:Do at Welland, provided the community with separate club premises at Modbury North for a token rent of $100 per year. Whether the community can recreate a vibrant deaf club in their new premises remains to be seen. Modern Deaf Societies are run as businesses providing services funded by governments, philanthropic grants and, increasingly, fees for service. They still fundraise but it is unclear how they spend these funds. They claim to put money back into the community. This seems to mostly take the form of the oft-cited free interpreting for funerals and occasionally ‘community development’ activities such as subsidised youth and ‘professional development’ activities. In the absence of a regular deaf club, deaf seniors still meet at the Deaf Society or in mainstream community halls and young deaf people meet in mainstream pubs and clubs. These two age groups seldom interact. In the old style deaf clubs, young and old mingled and learned from each other. In my twenties I had a wonderful deaf colleague and mentor in the legendary Dorothy Shaw, then in her sixties. Today I meet young deaf people who know little about their community’s elders and seem to assume that deaf people at the pub are the deaf community. These young deaf people miss out on mentoring from the community’s elders and the lessons of history. Older deaf people miss out on the vitality and new ideas of the young. Like Irish, Greek, Italian people, regardless of how included they are in mainstream society, deaf people would still benefit greatly from the richness and self-expansion that is found in clubs for ‘people like us’. We still see our deaf friends face to face in our own social groups and at occasional community events, there are still various sports and interest groups and Deaf Australia is still achieving progress for deaf people. But without a deaf club to provide a focus and a regular meeting place, much of the old cohesiveness has been lost. Community events are less frequent, less well attended; groups and organisations are harder to locate and less well supported; everyone is too busy living a more mainstream life and, like the mainstream community, is less able or inclined to volunteer. Today, although there has been progress, most of our advocacy issues remain the same. When information was shared face to face in Auslan at the deaf club everyone could understand and participate in discussions regardless of their English fluency or education level. Debates and disagreements happened face to face within the deaf community, policies and strategies were nutted out privately and we presented a mostly united face to the world. In the modern era of mostly English-based social media, disagreements, one-sided ‘debates’ and misinformation have become public for the non-deaf, unaware of the underlying issues and nuances, to scrutinise and misconstrue. Publicly the deaf community now looks less cohesive than privately it is. Intimidated by modern cyber bullying and disenfranchised by English text-based discussions on social media, the majority of deaf people are less able to have their say than they were twenty years ago when I regularly walked up the street and around the corner to the deaf club on Friday nights. The Auslan signs for ‘deaf club’ and ‘Deaf Society’ remain the same. Although there are some ‘deaf club’ nights in mainstream pubs, nothing has emerged to replace the old concept of the deaf club. We need to find a way to create a modern version of the deaf club, without giving up the gains we have made in access and inclusion. We need to do this in a way that is not dependent on Deaf Societies. Deaf Societies are still important organisations for the deaf community, but the world has changed. Although some seem to want to hang onto it, the old welfare model, where one organisation did everything for deaf people, has been on the way out since the 1980s. We need new ways of thinking that take lessons from the past and move the community forwards, not back. How would you describe the deaf community now? How is it different to how it was in the past? Since deaf clubs started closing in the 1990s, the need for them has often been discussed. Recently Vicdeaf and Deaf Children Australia established a committee to investigate the issue for Victoria. This is the first of 3 posts about deaf clubs. With the progressive closure of deaf clubs, the deaf community has lost much more than historic buildings. The buildings have been important. But even more, our sense of community and belonging to a place and our easy connection with each other have all been diminished. Since first becoming involved in advocacy organisations some 25 years ago, I have seen many life improvements for deaf people. Twenty-five years ago deaf people were seldom seen or heard outside the deaf community. Today we are more visible, more included in the mainstream community, with more options. Most of us, I’m sure, would agree that an inclusive society is a good thing. Inclusion and equitable access benefit everyone, society and, long term, the economy. But inclusion can come at a cost, and for deaf people it already has; we and our community are poorer in new ways. Twenty five years ago advocacy was a tough gig. Everyone wanted to patronise you, no one wanted to listen and the idea of government paying for an interpreter so you could meet and discuss an issue was unheard of. Today our advocacy organisations have strong consultative relationships with governments and industry and, usually, a seat at the table when issues affecting deaf people are discussed, with interpreters paid by government or industry. And yet in some ways it is harder now to be an advocate for deaf people than it was 25 years ago. At least this is the case until end-February 2015 when Deaf Australia’s government funding will end. 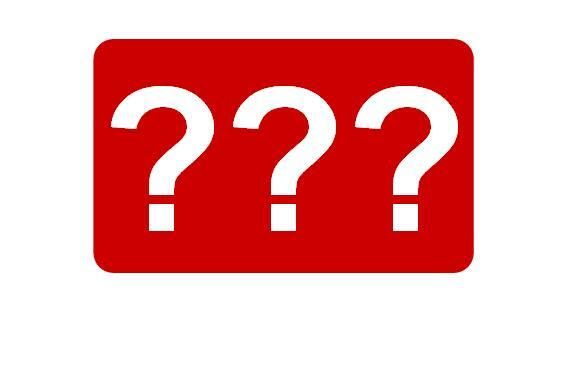 The future for advocacy is now uncertain. The deaf community used to be more insular, tight-knit and cohesive. “A ghetto”, to people who knew nothing about it. An accepting and nurturing place, to those who belonged. We met regularly at frequent community events and the deaf club on Friday nights where we mingled across age bands and interests, talked politics and news and nonsense, fell in and out of love, gossiped, told jokes – deaf jokes and jokes about hearing people – and generally enjoyed ourselves among our numerous friends. We played sports, volunteered and socialised together within well supported, well organised clubs, interest groups and advocacy organisations. It was an active, vibrant community, and at its centre was the deaf community centre – the ‘deaf club’. The deaf club provided us with a powerful sense of belonging. Deaf clubs were originally established in each state in the 19th Century by Deaf Societies at a time when they were paternalistic benevolent charities providing something for everyone – employment, church services, welfare services, sporting facilities, social facilities. Most Deaf people worked in the mainstream as tradesmen, in factories, in clerical positions and often the Deaf Society helped them find employment. A few worked for the Deaf Societies in low level jobs. The Deaf Society was essentially the community’s sole support organisation and many Deaf people were heavily dependent upon it. The, mostly hearing, people who worked there looked after Deaf people, made decisions for them, knew everything about them and their personal lives, kept files on them. The Auslan signs for ‘deaf club’ and ‘Deaf Society’ were identical. When I lived in Sydney in the 1980s and early 1990s, the centre of the deaf community was the deaf club at the Deaf Society in Cambridge Street, Stanmore. The building housed offices, meeting rooms, a community hall with a stage and commercial kitchen, table tennis and snooker tables, a crèche, a squash court and club rooms with a bowling green behind it. It was a lumbering three story building, white with red trim, which loomed over a predominantly residential street a scant ten minute train ride from the city centre. Next door, across a small grassy park was the dark brick Gordon Davis House hostel, and behind that a nursing home. All for deaf people who used Auslan. For several years in the early 1990s I lived in Cavendish Street, one street from and parallel to Cambridge Street. Many an evening found me at the deaf club volunteering on one or another committee. There I acquired skills that, because of communication barriers, I was unable to learn in the mainstream community. These skills then helped me in my career as a librarian and later an advocate. On Friday nights I walked up the street and around the corner to deaf club night in the community hall. Deaf club was for everyone, from babies to seniors and I met many wonderful people and enduring friends there. Deaf pub was held once a month in the bar on the lower ground floor. Deaf pub, managed by a volunteer committee of deaf people, was crowded and raucous and regularly resulted in neighbours making Monday morning complaints to the Deaf Society. 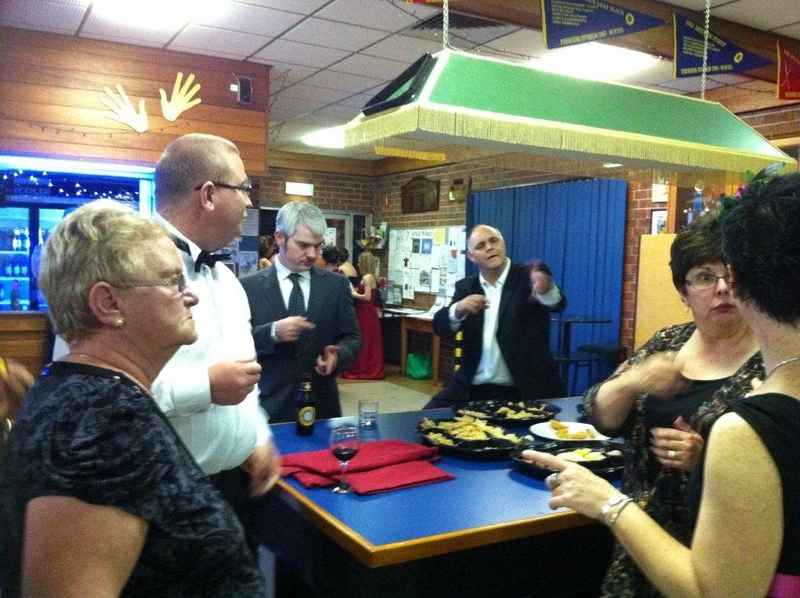 Deaf pub night was also Auslan club night in the community hall. 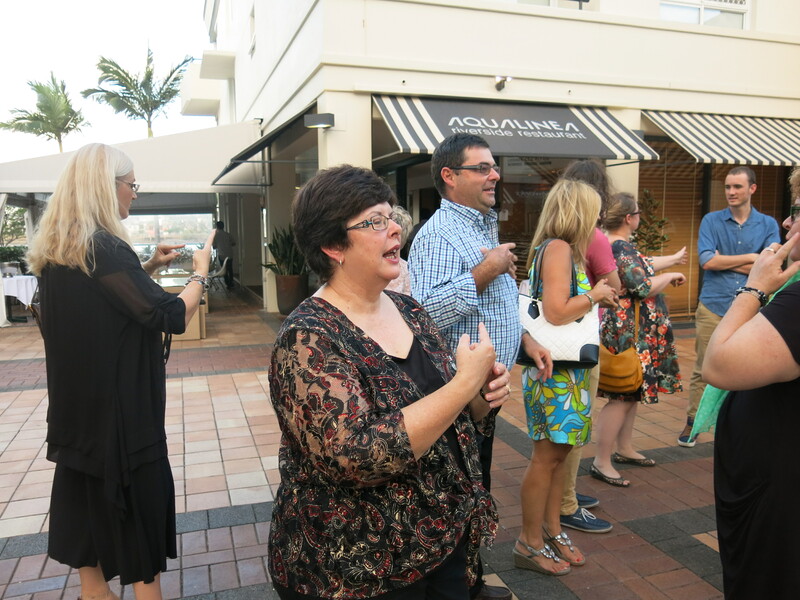 When Auslan club finished many of the hearing people came downstairs to the deaf pub to practice their emerging Auslan. Privately how we groaned! Daily we endured the trials of communicating with Auslan-illiterate hearing people. Deaf pub was our time to have fun and enjoy relaxed communication. Why couldn’t we just have something that was ours and easy for a change! But we understood it was to our benefit to encourage and help them learn Auslan, so we smiled and modified our signing to suit their abilities and returned to our conversations when they moved on to practice on someone else. It was wise to arrive early on pub nights. The room was small, quickly filling to capacity and as the night progressed a queue would form outside. One memorable night a friend got stuck out there for quite some time, outraged that she and other deaf people could not get into their own club because it was full of hearing people. Much community business occurred on deaf club and pub nights. At the time I was secretary of Australian Association of the Deaf (now known as Deaf Australia). The president was Colin Allen, now President of the World Federation of the Deaf. These nights were an opportunity to talk informally with deaf people about the issues of the day, helped us to keep on the pulse of deaf community views and keep deaf people informed about our activities. Did deaf club mean as much to you as it did to me? Tell us what it meant to you.